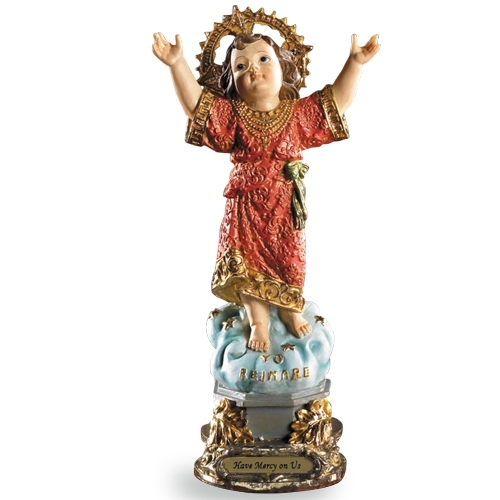 The Divino Niño, also known as Divino Niño de Bogotá or Divine Child Jesus, is a 20th-century religious wooden statue of the child Jesus originating from Bogota, Colombia. A cross originally in the back was removed upon purchase by Father Giovanni Rizzo. The 17-centimeter high statue with arms stretched out wide and wearing a traditional pink robe or tunic has an inscription "Yo reinaré" ("I will reign") at its base. It is one of the most popular religious images in Colombia, especially among Roman Catholics and it is claimed to have miraculous powers of fertility and healing.